In by far the most meaningless entry in our Power Rankings, we take a stab at the top 10 teams in League One before a ball is snapped! As disappointing as it was to see the Cougars relegated last year, they’ve got the most boom or bust potential in League One in our eyes. They’ve got exceptional speed at every position, as well as excellent tacklers and receivers. That’s when they turn up though, as last year they struggled for a consistent squad. If they’re all present and accounted for, the Cougars are the most talented team in the division. Again, this is another team relegated last year, but we feel, oddly enough, that they’ve got some momentum from that. 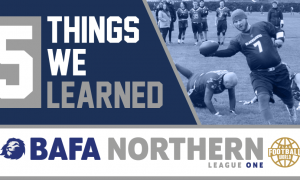 In the play-off game against the Revolution, we thought they’d probably get waxed, as the Warrington side very much ran through their schedule overall. The Samurai put in an exceptional effort, and were just two or three mental errors from probably surviving. That performance, coupled with their Sunday at Flagging New Year this season, and we feel confident that the Samurai are going to be the big bully of the MEC League One. The Souther Reapers took a bit of a nosedive at the end of last season, but their mid-season form had coloured us impressed, and we thought for sure they’d end up in a playoff spot. It wasn’t to be, but this season, if they stay the course, they’ve got a relatively straightforward task to win their division. If they can negotiate the Chichester Sharks, they should have a leg up to win the division with a decent enough record to contend for promotion. Their history with the others teams in the division has us feeling more confident about their prospects this season. 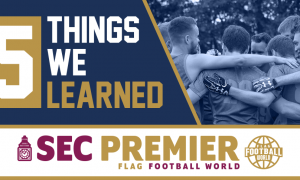 The Falcons were one of the top sides in the Southern Division One last year, but were unfortunate to be in the same division as the imperious Tydfil Trojans. This year? No such concerns. They’ve also managed to avoid any of the teams coming down from the Premier Division. The South West A is theirs to lose in our eyes. The Blackhawks lost far too much last season to be competitive in a tough MEC Premier Division, but they’ve reloaded in impression fashion, boasting a large squad with talent at every position. The bad news is that they’ve ended up in the same division as the Leeds Samurai. The good news is that we get to see those teams square off twice this season. Unfortunately, those matches are in week 4 and 5. The OFL (or South Midlands Outlaw) Gunslingers look an awful lot like the Northants Titans side from 2017. That team were so close to the playoffs, but figure to be one of the top teams in League One. They’ve got plenty of talent at every position, but its just whether or not they can have the chemistry to produce results early. Their division is very unfamiliar for them as well; the Leighton Steam will be gunning for them also. The Chichester Sharks undoubtedly have Premier Division quality in their ranks, but found themselves relegated last season. That talent will see them through we’re sure, and they’ll compete for promotion in year one. However we’ve got them just behind the Reapers for now – if they hit the ground running, we’re going to have a really exciting division race on our hands! It’s early days, but we’re tipping the Silvercats to be the class of the HNC League One. Overall, this is a division full of question marks and teams in flux, but the Silvercats have recent success in the Carnegie Winter League, which they won in emphatic fashion. 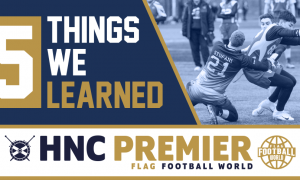 They routinely defeated the Glasgow Killer Bees, Grangemouth Colts and West Lothian Chargers – can they transfer that success to the league? The Wigan Bandits sit at #9, but could be winning the MEC West. This division has new faces and teams in their sophomore season, but the Bandits have a lot of experience under their belt, as well as some tournament wins. We’ve got them as the early favourite for the division. The Sabres are the most likely competitor for the HNC title in our eyes. Aside from the new logo, new uniforms and rejigged roster, they’ve been somewhat quiet. However, in their friendly fixtures, they’ve looked explosive. They dominated the Raptors and Killer Bees defences in pre-season action – can they do the same in the regular season to challenge the Silvercats? The Gwent Gators have been impressive in their limited outings so far, as have the Leighton Steam. They both have tough tasks overcoming other sides in their division for promotion, but we wouldn’t be surprised to see them compete. The Rugby Raccoons had a strong OFL campaign – if they can build on that they could make the Cougars sweat. In the North, the Grangemouth Colts are probably what they’ve done to upset us. The answer is nothing, but that’s pretty much it – they’ve done nothing. At Winter League (which is by no means a barometer of success), they looked out of sorts in some weeks. We don’t really know what other talent has been added to the ranks to compete – all this while the Silvercats, Killer Bees, Raptors and Sabres have all massively filled up the chamber. They’re the team we’re most scared to write off, but they’re difficult to gauge. The Oldham Owls in the 5 man format probably have the most talented team in the MEC West, but they struggled to get those numbers last season. If they can sort that this coming year, they’re going to push the Bandits.